Anesthesia Rebreathing Bags, also known as Medical Rebreathing Bags, act like a reservoir for expired gases, and are used to push gases into lungs. High grade later in black antistatic rubber is used to produce the GPC Rebreathing Bags. The capacity of these bags ranges between 0.5 and 6.0 litres. Our Rebreathing Bags can be used in circuits as well as anaesthesia machines. They can be cleaned easily and reused also. 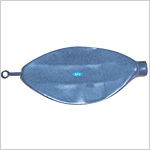 Send Your Buy Requirement For "Rebreathing Bags" AND Get Quote Quickly.